Later that day, we decided to add adventure into our trip by doing some seasports. 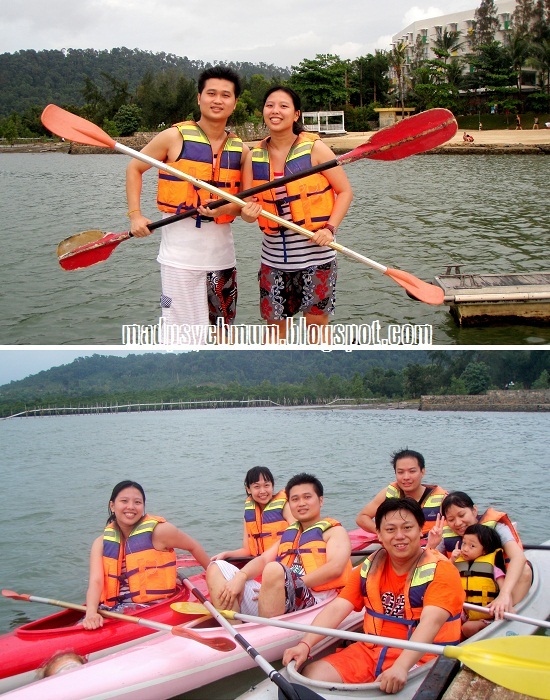 They had different packages but we decided to take the kayaking/jetski/bananaboat package at S$30/pax (for a group of minimum 3 persons). All ready with our life jackets on! First up was jetskiing, which I thoroughly enjoyed!﻿﻿ The wind in my hair and the magnificient view was lovely, albeit the constant prayers I made to God that it would not capsize. I doubt baby J will take well to jetskiing though as Little C sure didn't. She totally refused to sit on it and I can understand why. 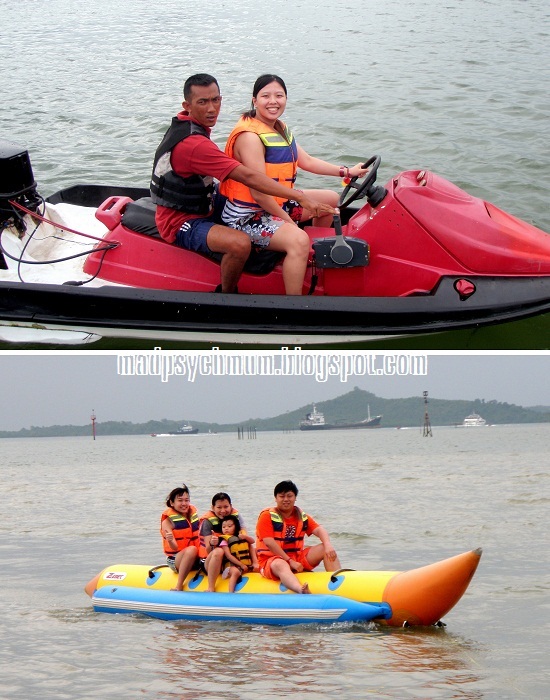 The banana boat ride would probably be more suitable for young children.﻿ ﻿The boatman will ensure that it will not be too dangerous for them. Obviously the adventure-seeking hubby and our friend K wanted more excitement so we sat on a separate bananaboat. The hubby thought it was yawnsville as it was just too slow compared to the jetski. I thought it was ok although slightly irritated as seawater kept splashing into my eyes. I refused to kayak with the crazy adventurers aka the hubby and K (who proudly announced his vast experience in kayaking) so I chose instead to kayak with K's wife Jes. Both of us prefered to go slow and steady while the guys prefered to chiong (slang for 'going all out') to a location further out to sea. Although the hubby also disliked this activity, calling it 'yawns', it is definitely very child-friendly. Bel told me that little C enjoyed this one the most and had a great time. This is something you can definitely consider doing with your little ones. Since we were already slightly wet, we decided to head back to the resort for a swim. I liked the relatively large pool. It even had goal posts for playing water polo and hoops for playing water basketball. Obviously a great activity for kids and adults of all ages. In the evening all of us went for our 1 hour Indonesian massage (which was included in our package) at the H Spa. I loved it! Reminded me of the Jamu massage I had after delivery, which was excellent by the way and highly recommended. She kneaded every muscle and pressed every cellulite out of my body. I left feeling revitalised and very happy.